Last 2013, a day before Christmas. My friend Dichel invited me to a day tour travel in Tagaytay. I asked him why ? we should’ve stay at home for Christmas eve..” I think there’s no reason for us to stay here at home to celebrate it since we are both from our family,” he replied. We both came from Visayas region and stayed in Manila for work by that time. I was pathetically inadequate that season. I am sad and subdued,the fact that I am also far with my family. So, I agreed and jaunt with him. Then, we prepared our stuffs and all. We went to Guadalupe Bridge where Pasig River was situated to ride a bus going to Pasay Terminal (I forgot the specific name of the terminal) . This jaunt in Tagaytay was like a dare because the idea to visit Tagaytay was like a pop in and placed on top of the table.On our way, we were like trying to feel if anybody will have that initiative to back out but after paying the fare, I guess we are really heading straight to the unplanned vacation. Tagaytay is just 2-2 1/2 hour trip from Manila, or even less if you have your own car or if you’re travelling not on the rush hour. Coming from North EDSA, the best way would be via MRT then a bus ride from Pasay City going to Tagaytay. The fare from Pasay to Tagaytay (Mendez Crossing) costs Php 87 + the MRT ride costing Php 15 (bef0re). When we arrived at the town of Tagaytay. I was feeling ravenously hungry. Good thing that there is an “Andoks Chicken Restaurant”. 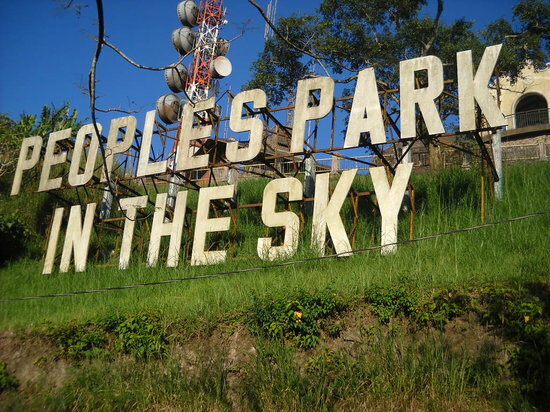 After our heavy meal, we first visited The People’s Park in the Sky also known as simply People’s Park is a historical urban park in Tagaytay, Cavite, The park was converted from an incomplete mansion, known as the Palace in the Sky built during the Marcos Era. The incomplete scaffolding of the mansion remained intact. The Shrine of Our Lady, Mother of Fair Love and a doppler weather radar station maintained by the Philippine Atmospheric, Geophysical and Astronomical Services Administration is also within the park. We paid 100 php our entrance fee (50 php/pax) at their front desk situated within the premises. I was amazed what’s inside the park. I can imagine how Marcos family had their best time when they resided the mansion. Because according to the locals, the mansion was owned by Imelda Marcos. The place was also planned to be used as the residence of the former US President Ronald Reagan. After our excursion in the Peoples Park. Our next stop was their “Picnic Grove”. 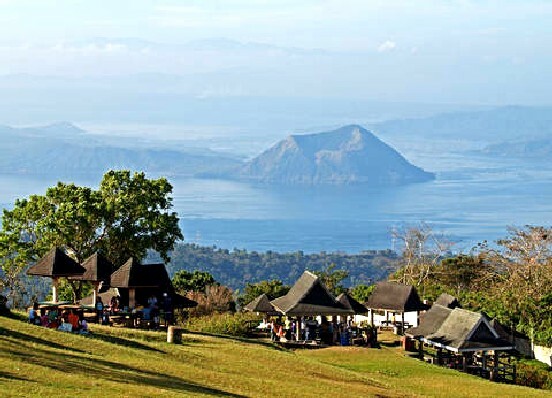 A famous place in Tagaytay that boasts the spectacular view of Taal, for just 50 php entrance fee. We initially planned to have our packed lunch here, but since we already did, we just roamed around the picnic grounds. We then proceeded to the viewdeck to take pictures of the breathtaking view Picnic Grove offers of Taal Volcano, the world’s smallest volcano. However, it got crowded there quickly so we just followed the cemented eco-trail going to the picnic huts. At the bottom of the viewdeck is the zipline and cable car jump off stations. Then we reached the picnic huts area. We didn’t pay for picnic hut rentals since we really did not plan on staying that long. We just sat by an empty hut, pausing for breath and trying to cool ourselves since it’s beginning to feel hot. Here, we just took advantage of the unobstructed view of Taal, snapping photos away. I think the view here is actually better than the one from the view deck. We then went to the rows of souvenir shops. They offer a wide range of products such as shirts, magnets, bags, wallets, hats, bracelets, necklaces, keychains made from different materials and designs. I bought a black shirt for Php140 since it was my first time in Tagayatay and my friend bought a coin purse for Php40. Tagaytay Picnic Grove Complex is located in Barangay Sungay East-End, Cavite with phone number (046) 413 4206. Ride a bus to Cubao, Quezon City. Ask for the one that will pass by Tagaytay and the rotonda circle of Tagaytay City. Ask the driver to drop you off at Tagaytay. From Nasugbu, ride a bus to Pasay. Ride a bus to Nasugbu. Take the LRT-1 to Baclaran station. Ride a bus to Tagaytay. From Balibago bus terminal in Sta. Rosa, ride a jeep to Tagaytay. Ride a jeep or bus to Balibago/Sta. Rosa via SLEX or National Road (passes by SM Sta. Rosa). 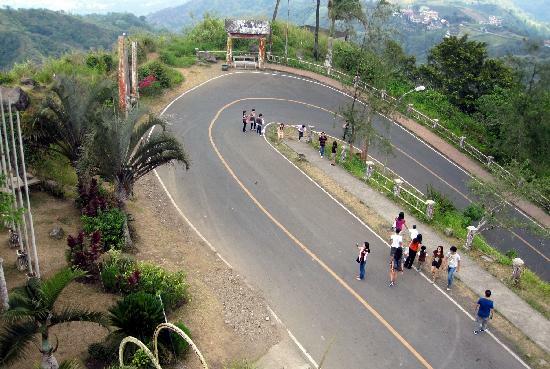 From Balibago Terminal, ride a jeep to Tagaytay. From Taft, in front of Rizal Park (Luneta), ride a bus to Tagaytay. From the West Service Road or Alabang-Zapote Road, ride a jeep to ManuelaMetropolis Alabang (Metropolis Mall). Take the LRT-1 to Baclaran. From Cubao, ride a bus to Batangas. Ask for the one that will pass by Tagaytay and the rotonda circle of Tagaytay City. From Net2, Market! Market!, or the Fort Open Field, ride the Fort bus/shuttle to Ayala. And that is how I Enjoyed my 2013 Christmas. How about you?What’s your exciting Travel Christmas Story? Previous postPlanning To Jaunt Within Southern Part of Cebu?